It’s astonishing how the world of cocktails has changed in the past decade. According to Seattle’s Miles “Scrappy” Thomas, when he began making bitters more than 10 years ago (his line of bitters, Scrappy’s, turns 10 in November), there were only four brands of bitters in the country. Now, there are more than 100, and that number continues to grow. Truly, it’s a bitter world, in the best way. Bitters, which have an alcohol base that’s infused with and flavored by fruits, herbs and other ingredients, were originally used medicinally, with a history going as far back as ancient Egypt. But in the early 1800s, bitters—along with sugar and water—began being added to spirits in a mixture called a cocktail. Drinking was never the same, and soon, numerous bitters were offered. The bitters assortment shrunk during the late 1900s as our collective cocktailing became more mundane, with fewer available ingredients and less creative cocktail preparations than were seen during the golden age of the late 1800s and early 1900s. 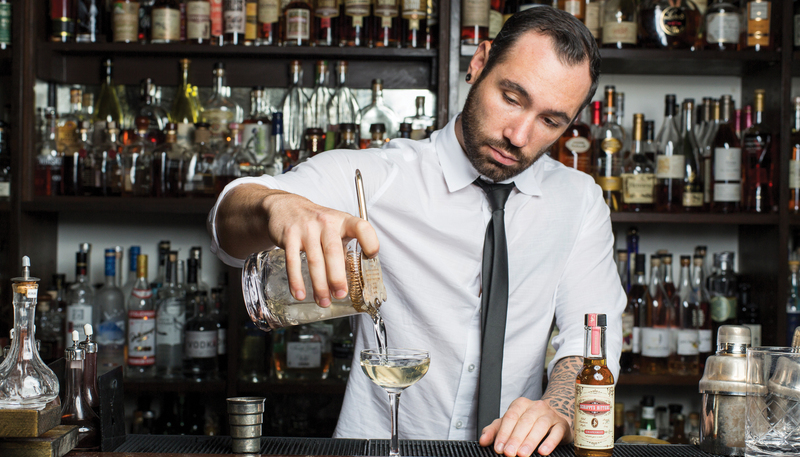 But when our cocktail revolution started in the early 2000s, Thomas, who at the time was bartending at Serafina (he also tended bar at Tavern Law and other local bars), began making his own bitters (along with syrups, liqueurs and vermouths). It was with a goal of having “some special moves behind [the] bar,” providing patrons with unique drinks and getting the upper shaker in friendly competition with other bartenders. He soon realized his bitters were at least as good as, and often better than, what was available commercially—and Scrappy’s was born. He now makes bitters full-time, and currently, Scrappy’s has 11 flavor offerings: aromatic, orange, lavender, chocolate, cardamom, grapefruit, black lemon, lime, celery, Orleans plus Firewater Tincture. A special 10th-anniversary bitters and a number of short-term seasonal flavors are in the works. Just don’t ask Thomas which is his favorite, because he says picking one would be like choosing a favorite child. Next, it’s tasting time, but trying a bitters on its own isn’t always the best taste test. The volume of a bitters that’s used in a drink is small, requiring a very robust flavor and a stout bitter backbone so the bitters isn’t overwhelmed by other drink ingredients. Once you’ve found a candidate that you feel matches your particular palate, it’s time to start making your own drinks, both alcoholic and nonalcoholic. (If you’re afraid to experiment, look for cocktail recipes that use these particular bitters.) While we think “cocktail” when mixing with bitters, one of my everyday favorites is a few dashes of bitters (or a dash from two different bitters) in a tall glass over ice with club soda. Refreshing and light, it also makes for an ideal after-dinner drink if you’ve eaten too much. Thomas agrees; recently, he’s been sipping Scrappy’s orange and aromatic bitters with soda. Scrappy’s Bitters are readily available in stores (check scrappysbitters.com for online retailers and distributors). Picking five from the array of worthy Scrappy’s Bitters is difficult, so don’t think of the flavors described below as the bitter end, but the bitter beginning. You can buy them in 5-ounce bottles for about $17, or try a Scrappy’s set of four half-ounce bottles for about $20. Remember, a little goes a long way! When most people think of bitters, they envision aromatic bitters, as this was the only style available for many years. Scrappy’s version uses organic herbs and spices with a little cinnamon and nutmeg surfacing and an agreeable bitter-and-bark finish. It’s ideal as a substitute for the more mass-produced brands in canonical drinks like the Manhattan or old fashioned. From the late 1800s through Prohibition, orange bitters were prevalent in popular drinks like the Pegu Club, Bijou and Martinez (which some believe is the martini’s precursor). Scrappy’s orange uses fresh and bitter oranges and peels, and has a light herbal backbone. The orange essence is lively in both aroma and taste. Try this in The Tranquil Hills cocktail, which combines this bitters with local rye and blackberry liqueur (recipe on seattlemag.com). While other brands of cardamom bitters are now available, Scrappy’s was the first and still the best, thanks to a predominant cardamom flavor mingling with citrus and a smooth bitter finish. It goes nicely with rum and will distinguish a hot toddy on a chilly afternoon. Also, check out The Elegant Spice, made with Scrappy’s cardamom bitters, white rum, grapefruit juice, Cointreau and dry vermouth (recipe at scrappysbitters.com). These bitters feature in one of my top cocktails of 2017, A Lovely Day for Bloodsport from Joli (Ballard, 618 NW 65th St.; 206.420.7259), in which the bitters is paired with grappa and other European hits. That drink showed off the bitters’ vivid and fresh lemon, floral and earthy nature. There are no other bitters on the market like this, and if you’re a lemon lover, keep this one at your home bar. To get started shaking, see the recipe for A Moment of Unmixed Happiness, which teams the black lemon bitters with gin and both blanc and dry vermouth (recipe on seattlemag.com). Scrappy’s first non-bitters product, it’s used—sparingly—in the same manner as bitters, and worth picking up if you like a bit of spicy bite to your beverages. Made from habañero peppers, with a very pure heat, Firewater allows for extra control when making fiery drinks. It’s been a surprise hit for Scrappy’s, and is adding intensity all over the world in spicier Bloody Mary’s and other cocktails with a kick. Be wary when handling and using, because it is a hot one.